As county executive, Foley was the lead individual carrying out the decisions of the Albemarle County Board of Supervisors. In his various roles at the county, he has pushed for the county to adopt a strategic, forward-looking mindset, including a focus on a Strategic Plan and Five Year Financial Plan. He also takes the lead in proposing a county budget that the supervisors debate and edit into the budget they eventually pass. Foley was born in Boston, Massachusetts but raised in Dale City, Virginia. Incidentally, his counterpart in Charlottesville, City Manager Maurice Jones grew up in the same area and attended the same high school. As the son of a member of the military, Foley spent some of his young years on the Island of Guam as well. Foley received his Bachelor's in Business Administration from Marshall University in May 1985 and a Master's in Public Administration from Virginia Commonwealth University in May 1993. He served as a staff associate at the Virginia Institute of Counties from October 1989 to May 1991. He worked as County Administrator for five years in Caroline County, Virginia and three in Cumberland County, Virginia before coming to Albemarle County. 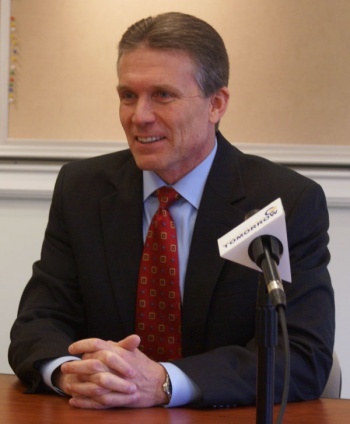 Foley came to Albemarle in 1999 after being hired as the county's Assistant County Executive. As assistant county executive, he has overseen almost all departments in the county, excluding human services. He now lives in Crozet with his wife Lori, where he raised three children. ↑ Web. County Executive Tom Foley Announces Resignation Effective February 1, 2017, Press Release, Albemarle County, Albemarle County, December 7, 2016, retrieved March 27, 2017. ↑ Web. Albemarle selects its new executive, Brandon Shulleeta, Daily Progress, September 8, 2010, retrieved September 9, 2010. ↑ Web. Salaries for municipal managers vary widely, Michael L. Owens, Daily Progress, World Media Enterprises, April 27, 2014, retrieved April 28, 2014. ↑ 4.0 4.1 Web. Meet Your Government: Tom Foley, Charlottesville Tomorrow, January 9, 2012, retrieved January 9, 2012. This page was last edited on 27 March 2017, at 12:33.